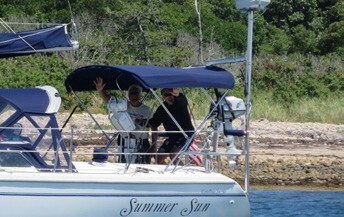 The Long Island Sound Catalina Association (LISCA) is comprised of sailors in the Long Island Sound area that own or have previously owned Catalina cruising sailboats. Members reside in New York, New Jersey and Connecticut, with boats from 25 to 47 feet harbored in many ports on Long Island Sound. The on-shore get-togethers will be followed by a gathering in Conscience Bay in Port Jefferson Harbor on Memorial Day weekend, with a hot dog roast/potluck dinner on the Sunday afternoon. Many LISCA members venture in early June to West Harbor in Oyster Bay for dinner on the beach adjacent to the St. Gertrude’s carnival, and in late June to Liberty State Park. The July Fourth weekend offers another opportunity for a raft-up, with many boats again returning to Port Jeff. For more information, visit sailLISCA.com.